I LOVE Chocolate and here is a coupon that is out of this world! It is from Mars ;)! These Mars Bites (my favorite is Snickers) keeps me going on a long day and during fun tailgating! I actually LOVE eaten them frozen! They are tiny bites of snickers that are the most perfect size and they are unwrapped! They are pretty much anything you ever wanted in these delicious chocolateness! Awesome Mars Bites Candy Coupon available to PRINT! When you go to grab the coupon and share it socially (either on twitter or Facebook) or e-mail it to 3 people the value of the coupon will double!! Who doesn’t want more savings on candy!?! 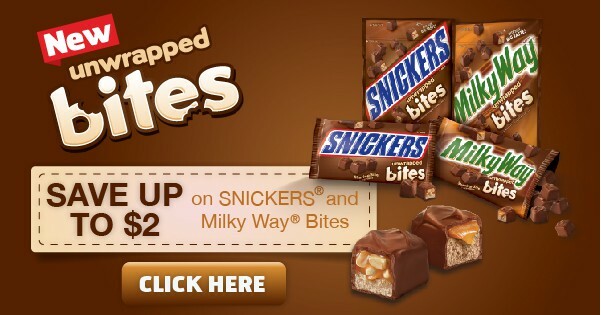 If you love chocolate, you won’t be able to resist new SNICKERS and Milky Way Bites. Enjoy unwrapped, bite-sized morsels that are great in recipes or by themselves! For tailgating, these #GameDayBites will be sure to make the crowd go wild. Hurry before coupons run out! Click for YOUR COUPON Here! Read more about my shopping trip by visiting my Google + Story!